Hey! I’m so glad you’re here! Are you looking for a steamy at-home date night? Who isn’t, amiright? Well, you’re in the right place, because this date night is all about hot and steamy. It’s perfect for anniversary celebrations, especially if you’re on a tight budget. Hey, romance ain’t dead, even if the money tree is bare. I had planned to do this Between the Sheets Bedroom Game date night on Christmas Eve, but that didn’t work out. And I had a terrible time getting my hands on a gift for Mr. Napping this past Christmas – three different gifts fell though – and I ended up giving him our Between the Sheets Bedroom Game. We played one night shortly after he got it and it was a magical night, indeed. You can check out how I set up our date at the link above. 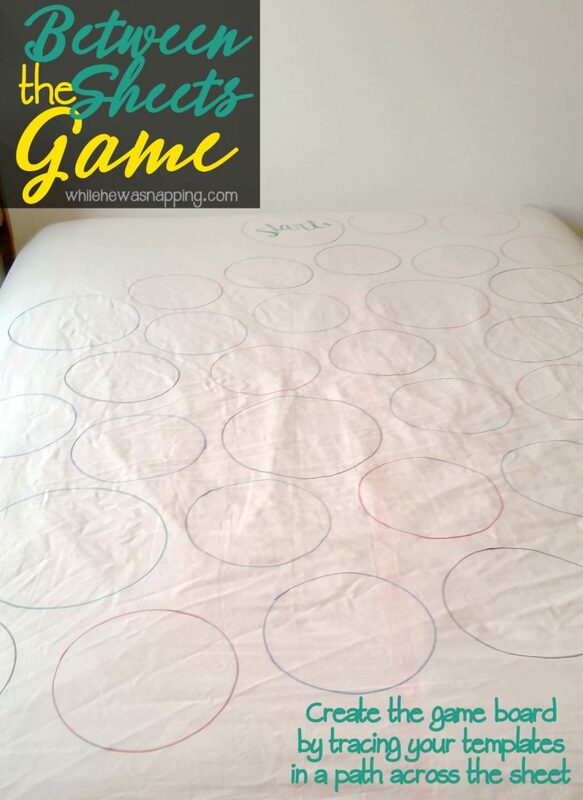 Today, I’m going to walk you through making your own Between the Sheets DIY Bedroom Game. 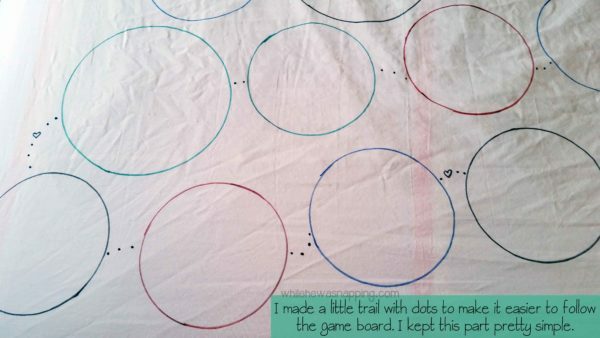 Something you can use as a template – I traced a dinner plate and a saucer on pieces of cardstock, cut them out and used the cardstock templates as my pattern to create spaces on my game board. 1. Lay out the plastic drop cloth on your undressed bed. This will protect your mattress from any bleed through from the markers. I didn’t have any issues with that, but I figured I’d take a better safe than sorry approach. If you don’t lay down the drop cloth, and the markers bleed through onto your mattress, I’m definitely gonna say I told you so. 2. Pull the fitted sheet, over the drop cloth, onto your bed. 3. Decide what to use as a template for your game board spaces. I just traced one of our dinner plates and a saucer onto pieces of paper. You can get fancy if you want, but I just went with simple circles. 4. 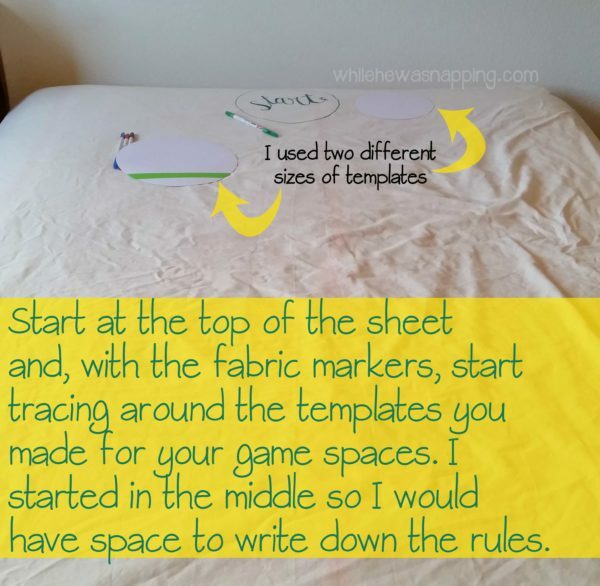 Use the fabric markers to trace the template on to the sheet, creating a path from the top of the sheet to the bottom. I had four rows of spaces on my board. I made a little trail of dots from one space to the next so we didn’t get lost. 5. Now comes the fun, and hard, part: filling in the spaces. This is where you can personalize it to your relationship. Get as risque and steamy as you are comfortable with. Shortly after we got married, Mr. Napping and I discovered that both our love languages are physical touch. So, I focused on that in our game board. If you don’t know which love language you and your mate speak, I highly suggest you find out. It has helped so much in our relationship to know how to make the other feel loved and appreciated. It also helps that we are both the same, but we just got lucky there! 6. This was what really made the night! 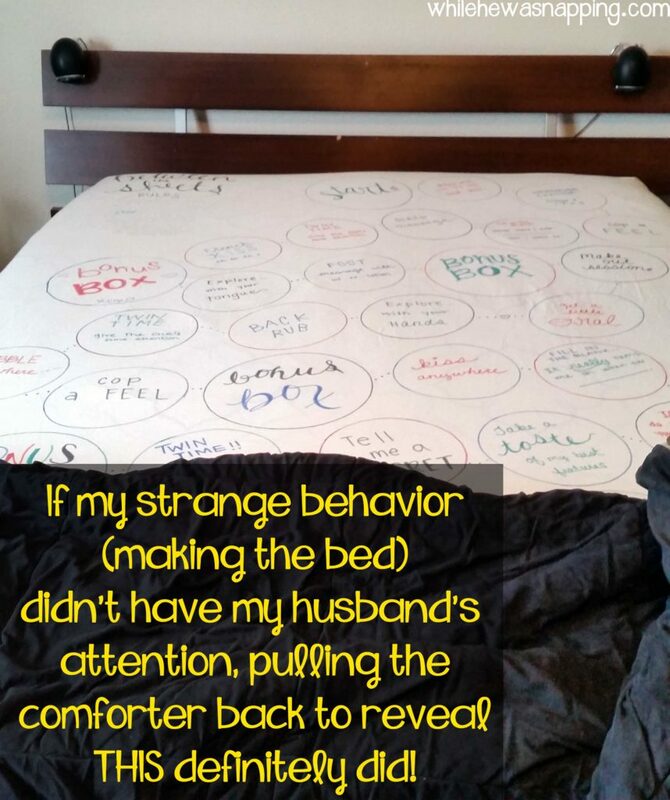 I included bonus spaces in our Between the Sheets Bedroom Game. They were the large circles and each was labeled “BONUS BOX”. If one of us landed on those spaces, we got to choose a box; in which I had little mini-games for us to play. You can get some ideas for these if you click that yellow button below. I had a box for every space, but we were allowed to choose any box we wanted. That was fun. Seriously, don’t skip this part. What do you put in your bonus boxes? GET 9 BONUS BOX IDEAS! 7. 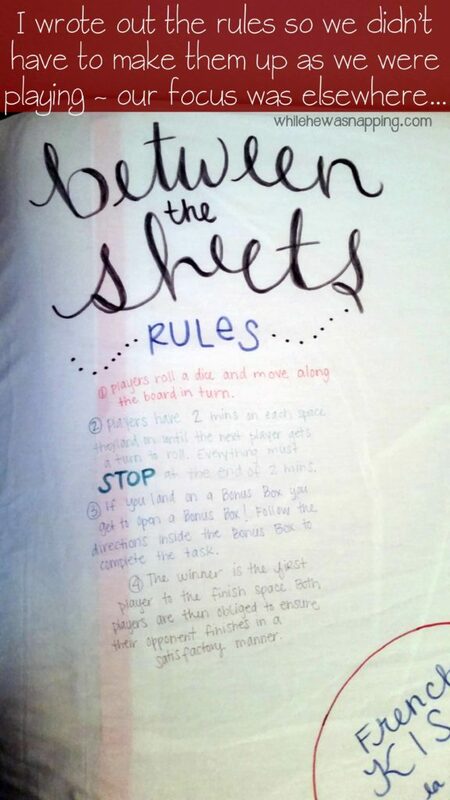 Then I wrote out the rules. I didn’t want to have to make up rules as we were playing, because the focus was supposed to be on the two of us during game play. Having the rules already written out made it so we could focus on us, not how to play the game. described game play and what happened when one of us landed on the BONUS BOX spaces. 1. Players roll a dice and move along the board in turn. 2. Players have 2 minutes on each space they land on until the next player gets a turn to roll. Everything must STOP at the end of 2 mins. 3. If you land on a bonus box you get to open a bonus box! 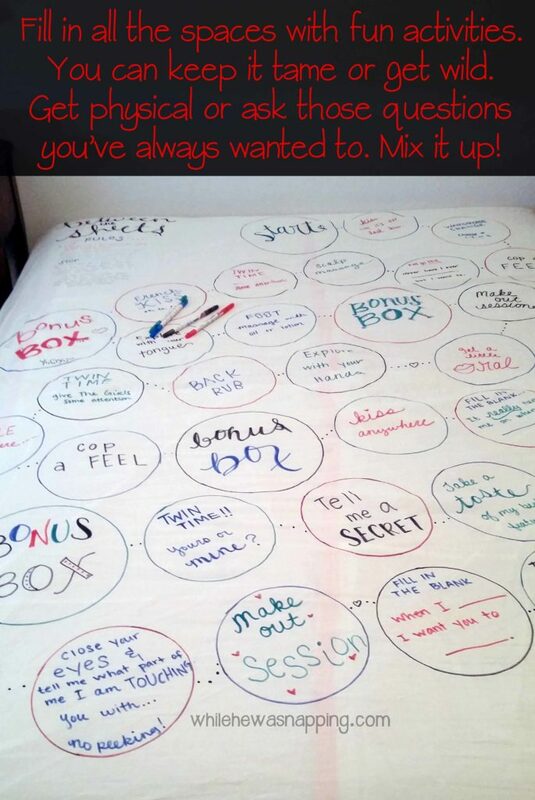 Follow the directions inside the bonus box to complete the task. 4. The winner is the first player to land on the finish space. Both players are then obliged to ensure their opponent finishes in a satisfactory manner. That’s all there is to making the game. It’s pretty easy and, truly, the difficult part is coming up with things to write in all the spaces. You could leave some blank if you wanted, but I decided I wanted lots of intimate opportunites. Follow the directions on the fabric marker packaging to set the ink. I waited 48 hours and then washed and dried our sheet, per the directions on my fabric markers. Having played it once, I can say now, I wish I would I have put in a few more spaces that weren’t so physically involved with more sensitive areas of the body. It was awesome and I loved it, but it wasn’t something I could have enjoyed again the next day. We ended up on “Twin Time” far more often than I expected and the girls were a bit tender the next day… Maybe consider a few “skip a turn” spaces to give yourselves a little break and make the other spaces more enticing! Despite that though, I absolutely can’t wait to play again. In all honesty… the sheet is still on our bed… Oo-la-la! Don’t forget to download your Bonus Box ideas! Hit that button below for the download page! GET 9 BONUS BOX IDEAS! Can I have bonus box ideas also? I sent an email. Enjoy! I sent an email to you. Let me know if you didn’t get it. Enjoy! Hi!! I was wondering some ideas for the “Bonus Box” spaces & the actual “Bonus Boxes”. Can you give me some tips or actual things you guys might have done for yours?? Thanks!! P.S. We are looking forward to trying this game as well!! I sent you an email, I hope you got it. Let me know if you didn’t and I’ll find out from you the best way to get in contact and make sure you get it. Thanks for stopping by! Can you please send the “Bonus Box” ideas to me too? I’d like to see what your ideas were to build my own! I sent you an email. Let me know if you didn’t get it and we’ll figure out how to best get in touch!